The last post reported on 33 climate trends discussed in “State of the Climate 2017,” a report published in the Bulletin of the American Meteorological Society. This post characterizes the 2017 climate in the United States. Be sure to catch that this is for 2017, not 2018, the year just ended. In what follows, “CONUS” means the continental United States. All anomalies compare to the 1981-2010 average. Figure 1. 2017 Temperature Anomalies Across the CONUS. Source: Blunden, Arndt, & Hartfield, 2018. The annual average temperature in 2017 for the contiguous United States (CONUS) was 12.5°C or 1.0°C above the 1981–2010 average—its third warmest year since records began in 1895, 0.2°C cooler than 2016 and 0.4°C cooler than 2012. 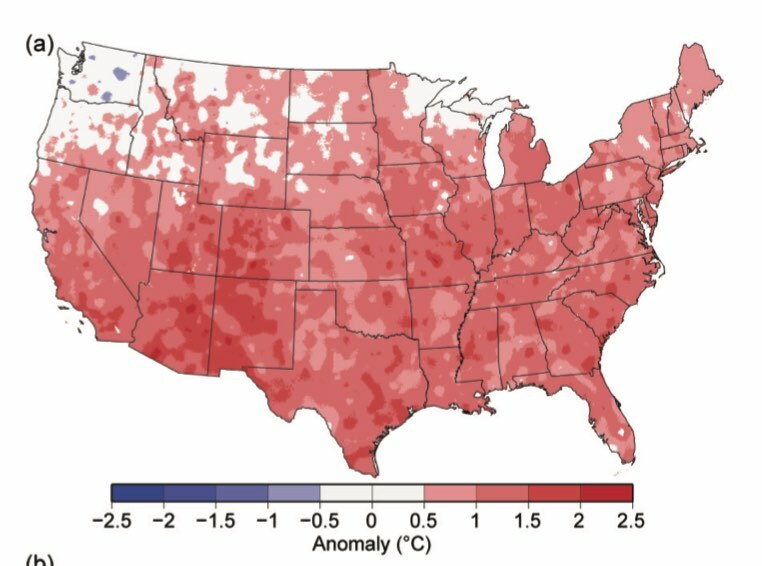 Figure 1 shows a map of 2017 temperature anomaly across the United States. Every state was warmer than average except for Washington. Most of Missouri was 1.0-1.5°C warmer than average (1.8-2.7°F). A few areas were even warmer, but the map isn’t sufficiently detailed to determine for sure which areas they were. Table 2. 2017 Precipitation Anomalies Across the CONUS. Source: Blunden, Arndt, and Hartfield, 2018. Averaged nationally, precipitation was 104% of average, making 2017 the 20th wettest year in the record. The pattern was variable, however, as shown in Figure 2. In particular, winter precipitation was higher than average, with Nevada and Wyoming each having the wettest winters on record. The California mountains were wetter than average (I reported on the large snowpack in the winter of 2017 in previous posts). So was eastern Colorado-New Mexico. 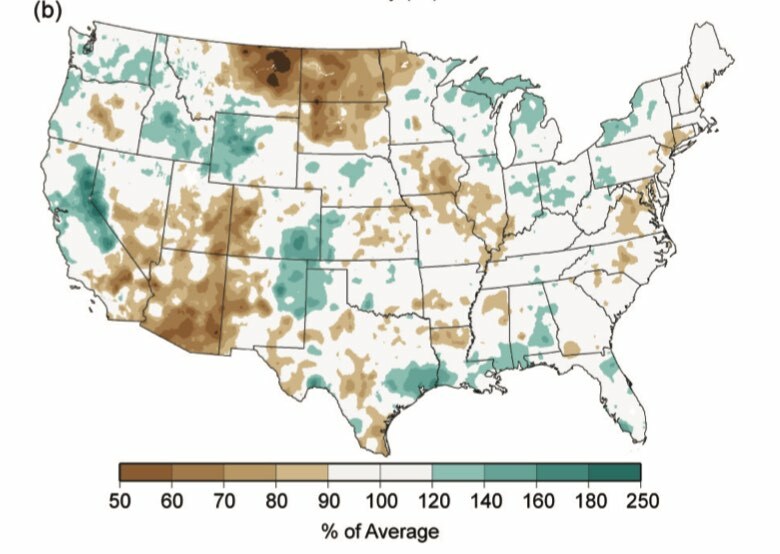 On the other hand, much of the Southwest and the northern Plain States were in drought. It was also dry along the Mississippi River from the Missouri Bootheel into central Iowa. Figure 3. Source: Blunden, Arndt, and Hartfield, 2018. 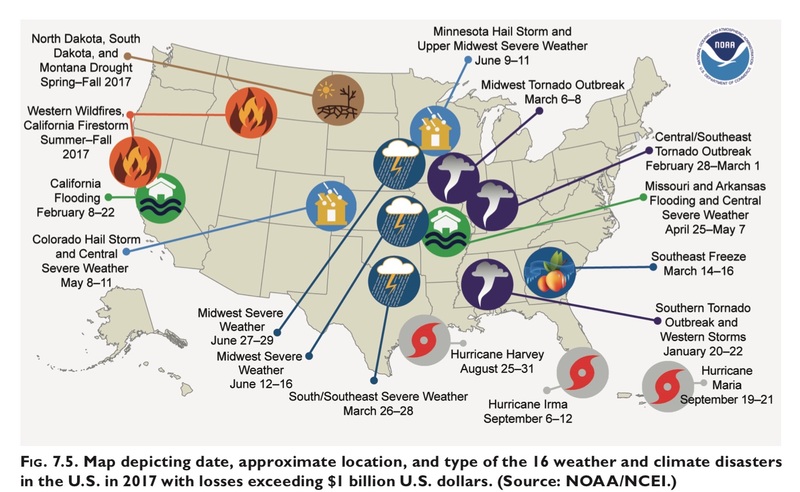 There were 16 weather-related events in 2017 which resulted in damage of more than $1 billion. That tied with 2011 for the highest number of billion-dollar disasters. The total damages they caused was $306 billion, a new record. Figure 3 shows a map of where they were roughly located. There were three major hurricanes across the southern United States, plus catastrophic fires in California and other western states. Missouri and Arkansas were affected by flooding in late April-early May 2017. Missouri had 13 fatalities and 155 injuries from weather-related disasters in 2017, and a total of $156.20 million in damages. There have been many years when the Missouri’s weather-related damage has been below $100 million, but in 2011 it was over $3.4 billion. Blunden, J., D. S. Arndt, and G. Hartfield , Eds., 2018: State of the Climate in 2017. Bull. Amer. Meteor. Soc., 99 (8), Si–S332, doi:10.1175/2018BAMSStateoftheClimate.1. Downloaded 12/15/18 from https://www.ametsoc.org/index.cfm/ams/publications/bulletin-of-the-american-meteorological-society-bams/state-of-the-climate. By mogreenstats in Climate Change, Weather Patterns on 2019/01/17 .